1 of 4 In a small bowl, whisk together cinnamon, cumin, ginger, pepper, preserves, vinegar and 1/2 tsp of the salt. While whisking, add oil in a thin stream. Set aside 3 tbsp of the sauce for couscous. 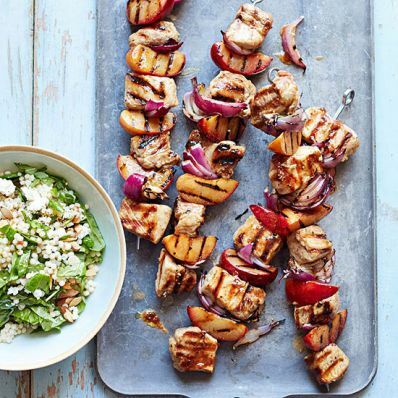 2 of 4 Thread 6 metal skewers with pork, onion and plum wedges: Use 5 or 6 pieces of pork per skewer, alternating with 3 plum wedges and as much red onion as desired. 3 of 4 Heat grill to medium-high. While grill is heating, cook couscous in lightly salted boiling water for 8 minutes. Drain and rinse with cool water. Toss in a bowl with spinach, feta, almonds, 1/4 tsp of the remaining salt and the reserved 3 tbsp sauce. Set aside. 4 of 4 Brush skewers with some of the sauce. Place on oiled grill, sauce side down. Brush with remaining sauce. Grill for 3 minutes, then flip over. Grill for 3 minutes more, or until pork is no longer pink. Season with remaining 1/8 tsp salt and serve with couscous salad. Per Serving: 3 g fiber, 34 g carb., 492 mg sodium, 38 g pro., 16 g Fat, total, 439 kcal cal., 4 g sat. fat, 89 mg chol.